Virginia Mason Hospital adapted Toyota’s Lean Management style to streamline patient care while boosting the bottom line. When Virginia Mason Medical Center in Seattle started losing money in 1998, its CEO began a search for a new management system that would get the hospital back on track. After two years of visiting hospitals around the U.S. and talking with many of the smartest minds in the health care industry, he concluded that there wasn't a single medical institution in the entire country that had a system worth emulating. Instead, he turned to a Japanese carmaker for inspiration. Dr. Gary Kaplan, head of Virginia Mason Hospital in 2001, thought he could adapt Toyota’s lean management style - which focuses on eliminating waste in the production process - to improve healthcare. "He turned to the Toyota production system because it was clear to him that taking these principles and tools and adapting them to healthcare could significantly make Virginia Mason a more efficient operation," says efficiency expert Charles Kenney, author of "Transforming Healthcare, Virginia Mason Medical Center’s Pursuit of the Perfect Patient Experience." One of the first Toyota concepts Kaplan instituted was value stream mapping, which involved taking a complicated process and breaking it down into individual steps to find ways to make each step more efficient. Virginia Mason hired several Japanese consultants, called senseis, to help them with their first value steam map: a cancer patient’s visit. In his book, Kenney recounts how the senseis instructed the staff to trace the patient’s journey on a map of the hospital, using a piece of blue yarn. Toyota developed the Kanban system to keep supplies stocked and organized. Each blue bin is divided in the middle. When one half is empty, it signals the staff to reorder supplies. "And at the end of the process, the blue yarn was snaking around this piece of paper - the schematic on the floor - and it was this immensely powerful visual experience for the entire team," says Kenney, "and they realized that what was happening was they were taking these patients, for whom time is absolutely the most precious thing in their lives, and they were wasting huge amounts of it." So the team used the lean management approach to refine the process of administering chemotherapy treatments. By sorting out the steps, simplifying and standardizing them, they were able to cut the amount of time it takes a patient to receive treatment by 50 percent. 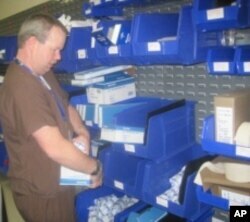 Then, they turned to other departments, finding ways to increase efficiency and improve safety. "So the Virginia Mason Production System is now viewed throughout the world by many people as a viable alternative to the current system," Kenney says. It has been adopted by dozens of hospitals in the United States, including Barnes Jewish in St. Louis, Missouri. Hand-drawn lines connect dozens of small pink and yellow sticky notes in the strategy room at Barnes Jewish in St. Louis, Missouri. Kent Rubach is one of the senseis Barnes hired to guide them on what they call their learning journey. The first change he made was to set up a strategy room for hospital staff. Above a long conference table is a complicated diagram which takes up one entire wall of the room. It is made up of hundreds of hand drawn lines that connect dozens of small pink and yellow sticky notes. It’s just like the charts in Toyota’s strategy rooms. "You would see the exact same thing, for a part going from raw material to the finished good," Rubach says. 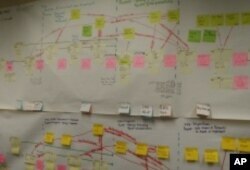 But in this case, the value stream map illustrates the process of a patient coming into the hospital with a stomach ache. Each one of the pink notes represents a point in the process where a patient has to wait. "So if we do have wait, we're trying to add value to that wait, and not just have them sitting and doing nothing," says Daryl Williams, head of the Emergency Department at Barnes. "Can we give the patient education? Can we get their labs done ahead of time so when they get to see the doctor all that stuff is back?" According to Williams, under the old system, an acute abdominal pain visit typically took three hours. Today it’s two hours. A key principle of the Virginia Mason Production System is to encourage staff members to speak up whenever they see a part of their job that can be done more efficiently or a process that could be improved. 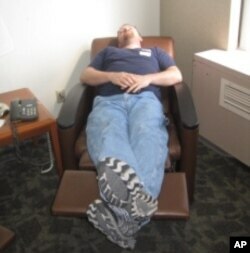 John Davis sleeping in a chair that reclines into bed while his wife is in the ICU. An employee who worked in the Intensive Care Unit had an idea to help patients’ families, who often spend day and night in the waiting room while their loved ones are in the ICU. Linda Henderson, whose fiancé suffered a stroke, has been living in the waiting room for eight days. Before the lean changes, she would have had to sleep in a chair or on an air mattress on the floor. But based on the employee’s suggestion, the hospital replaced the furniture in the waiting room with special chairs that recline into beds. "I can lay back and I have my blanket and my pillow or my teddy bear for my pillow and then I snooze and go to sleep," says Henderson. The improvements at Barnes Jewish, Virginia Mason and other hospitals using lean management techniques have been noticed. A recent study of the nation’s hospitals put Virginia Mason in the top one percent in safety and efficiency for two years running. But lean management is not for everyone. It requires a tremendous investment of time and resources as well as a leadership willing go forward despite resistance from doctors and staff to the idea of operating like a factory. Also, the process never ends. As the Toyota senseis say, they live in the biggest room in the house, the room for improvement. Note: An earlier version of this story incorrectly reported that Virginia Mason Medical Center is located in St. Louis. VOA regrets the error.